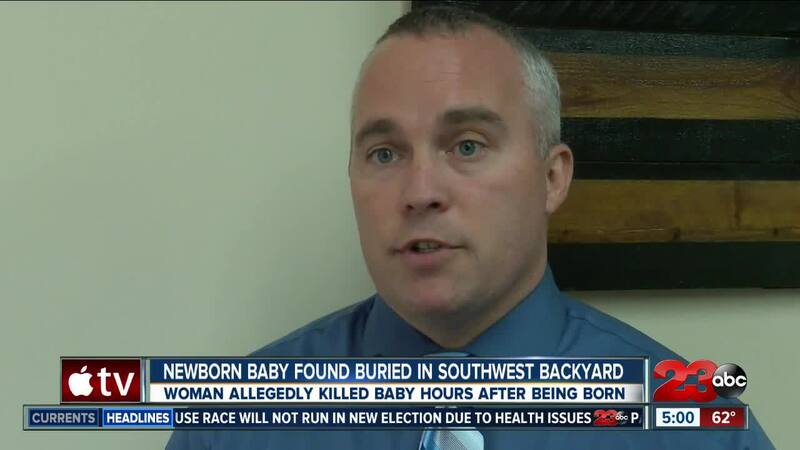 Investigators said a newborn baby boy was killed and buried in the backyard of a home in southwest Bakersfield. 43-year-old Beant Kaur Dillion and 47-year-old Jagsir Singh were both arrested in connection to the case. BAKERSFIELD, Calif. — A woman allegedly killed a baby boy hours after he was born and buried him in the backyard of a home in Southwest Bakersfield, according to BPD. On Tuesday, February 26, Bakersfield Police responded to a residence in the 5200 block of Shining Crag Avenue in Southwest Bakersfield for a possible homicide. BPD says the investigation revealed that a teen gave birth to a live baby boy at the residence in November of 2018. Within hours of the birth, BPD says 43-year-old Beant Kaur Dhillon took the baby and allegedly murdered him at the residence. According to BPD, the alleged victim told her school what happened and the school contacted authorities. BPD says investigators discovered the baby boy's body in the backyard of the house. 23ABC obtained photos from a neighbor showing what appears to be BPD detectives searching through a large stone planter in the backyard of the home. Beant Kaur Dhillon, 43, was arrested for murder and felony child abuse. Jagsir Singh, 47, was arrested in connection with the investigation for felony child abuse, and conspiracy. Singh posted bail and was released Wednesday night. Two children were taken into protective custody from the house. Singh and Dhillon are husband and wife, according to neighbors who spoke to 23ABC. Police have not said how the couple is related to the teen, to protect the identity of the teen. Dhillon is scheduled to be in court Thursday at 3 p.m. Singh is scheduled to be in court March 13 at 8 a.m. Anyone with information regarding this case is encouraged to call Detective Littlefield (661) 326-3558 or the Bakersfield Police Department at (661) 327-7111.